HERE IS THE PRESENTATION PROVIDED! Amy Schumacher-Rutherford came to speak at the Panhellenic General Assembly on September 11, 2018. She invited our women and entire community to get engaged and active with their voting rights. Below we have provided you with the slideshow she presented to us! Amy Schumacher-Rutherford teaches at the University of Kansas, where she is finishing her PhD in communication studies and MA in political science. Before enrolling at KU, Amy was in charge of marketing at a management consulting firm in Washington, DC. Amy has a BA in strategic communication from Miami University and an MA in communication studies from Marshall University. She has worked in a variety of communication and political roles throughout her career. We know that young women care deeply about issues affecting them – from healthcare to education – but we also know this doesn’t translate to votes. A recent poll by Refinery 29 and CBS News found that 70% of 18-35 year-old women feel their individual rights and liberties are being threatened right now and 70% feel the country is headed in the wrong direction. Yet, only 30% of these women reported they will definitely be voting in the midterms. There is clearly a disconnect between concern and casting votes. We need to close that gap so we get a seat at the table, so our voices are heard, so we have a say in how our community, state, and nation are run. 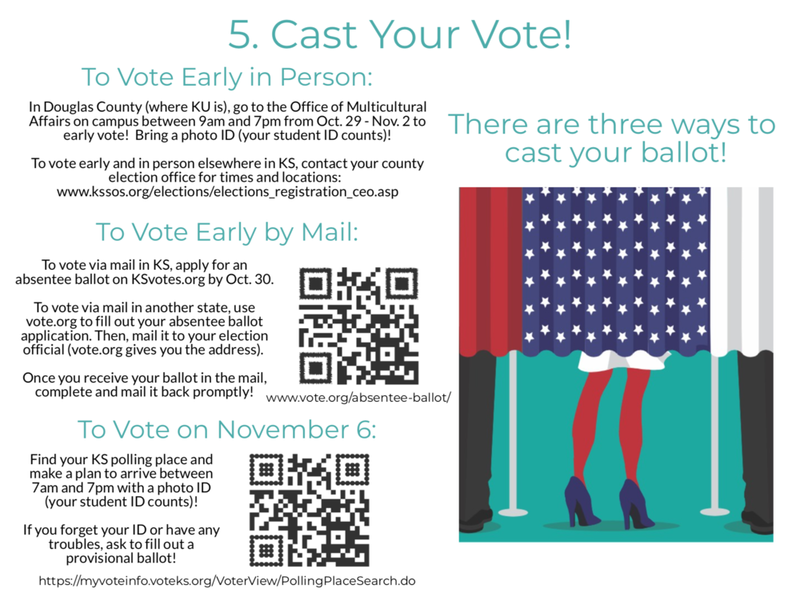 follow these easy steps to get your vote on. Encourage your chapter members…a contest is coming! Thanks for encouraging and supporting our women, Amy! Stay safe, happy, and you!